When designing for the Humanitarian Data Exchange (HDX), I’m always curious to know more about how people are using the site as part of their daily workflow. One consistent request from users has been the ability to connect directly with contributors to ask questions about their data. This direct communication follows a network model where people have access to each other without having to go through a central point, i.e. the HDX team. 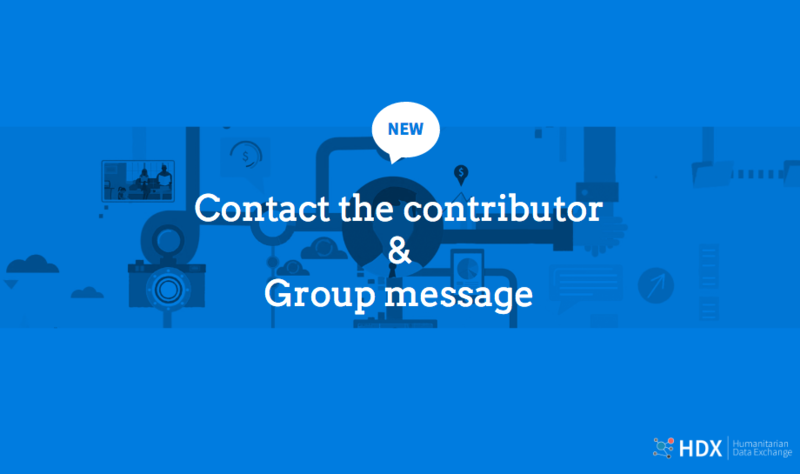 Today we are releasing two new features to support communication between registered users: ‘contact the contributor’ and ‘group message’. ‘Contact the contributor’ lets users send inquiries directly to data contributors. This feature is available on all dataset pages. If you are not already a registered user, you will be prompted to sign up before a message can be sent. Inquiries can be anything from a general question about a dataset to reporting a problem such as a broken link. ‘Group message’ lets organisation members send messages to other members of your organisation. You can use this feature to discuss and collaborate on datasets that have been shared by your organisation. You can send messages to all members or to specific roles within the organisation (i.e. admins or editors). The group message feature is accessible from all dataset pages and can be used for data that is shared privately and publicly. It is not visible to anyone outside of your organisation. Please tell us what you think about these new features. Send feedback to hdx.feedback@gmail.com or reach us on Twitter at @humdata. I am a GIS assistant in the international Red Cross, regional delegation of Dakar. I need the data (administrative boundaries of countries not covered to make maps but I cannot download these data. I need your support.